Anti-Russia and disinformation hysteria has reached new heights, and — after the Obama administration announced the expulsion of 35 Russian diplomats from the U.S., among other retributions for an ostensibly hacked election — the Washington Post continued its foray into Fake News with an article suggesting Kremlin actors hacked the electrical grid in Vermont. Interesting that one of the goliaths of journalism — a long-trusted, venerated institution with a prior history of admirable muckraking — would, of late, begin publishing articles based solely on the testimony of unnamed officials offering little more than references to past, equally vapid hysteria about Russia. All of this comes on the heels of exceedingly dubious claims The Russians somehow hacked either ‘the election’ or the emails of the Democratic National Committee and Hillary Clinton campaign chair John Podesta — and expose corruption therein — to persuade American voters to cast ballots for Donald Trump. Why The Russians would so favor Trump has not yet been explained — nor has a single shred of evidence linking the Putin establishment to anything even remotely resembling the hack of any U.S. system. A joint report from the Department of Homeland Security and FBI purported to evince Russian government fingerprints on the 2016 electoral cycle — but the disclaimer-laden information did not do so. Nonetheless, the lame duck Obama administration proffered the report as part of its evidence to justify expelling Russian diplomats and imposing sanctions — an act vehemently condemned by Russian officials and, at first, believed sufficiently aggressive to turn the new Cold War perilously hot. Fortunately, Putin coolly laughed off this threadbare assessment — as he has previous anti-Russia delirium — and announced counter-retaliation for Obama’s ‘kitchen’ diplomacy, as he aptly termed it, would not be forthcoming. Thankfully. Because, despite the valiant efforts of the U.S. government — through its loyal corporate media bullhorn — to paint Russia as the greatest evil Americans now face, the allegations have no basis in fact. But it hasn’t been for lack of attempt to convince the American public The Russians are all but guilty of electing Trump — and the Washington Post has led the Red Scare parade straight down that McCarthyite path. In fact, it was the Post who first published an article demonizing nearly the entirety of independent and right-leaning media as either hapless or intentional agents of the Kremlin — but cited nascent organization PropOrNot as evidence of the claim. Those allegations quickly fell apart both for literal absence of evidence and the amateurish ramblings displayed by PropOrNot on social media amid the fallout from the Post’s irresponsible report — which has since been all-but retracted. No proof — no report, no notes, not one iota of tangible information — was provided to back that assertion. Indeed, the Washington Post has championed modern McCarthyism — frequently publishing exclusive reports amounting to so much fiction. And there might be a damned good reason the Post and the Obama administration have aligned on all things anti-Russia. That explanation is telling given two critically pertinent circumstances. The same year Bezos purchased the Post, Amazon landed a $600 million deal with the CIA to develop a coordinated computing cloud for all 17 agencies of the U.S. intelligence community. Perhaps superficially innocuous on its own, that sizable deal appears somewhat darker in consideration of this year’s quasi-official continuance of the U.S. government’s most notorious propaganda program, Operation Mockingbird — during which intelligence agents posed as the media to imbue pro-American propaganda and censor certain information. This nasty law provides the impetus for suppression of news unfavorable to the political establishment — and the creation of news topics painting foreign foes in a negative light. Such as Russia — the Washington Post’s perpetual villain. Taken in the context of this Russians Hacked Into Vermont’s Electrical Grid To Doom Us All narrative, Bezos’ cozy business relationship with the CIA — and the government’s formal foundation of a propaganda department — tells of a potential direct conflict of interest when it comes to reporting actual news. Of course, the Post’s bold assertion quickly morphed as it was passed along by other corporate media outlets to become a generalized threat to the country’s electrical grid — even though tiny Vermont’s had never been compromised. All of this is designed to Red Scare the bejeezus out of ordinary Americans and confuse reality and fantasy to such a degree that Russia appears as a general threat — Bad Guy Number One — so the U.S. government can advance otherwise unsavory operations unscathed by public backlash where the old Cold War foe acts more laudably. Such as in Syria. Russia Did It is nothing more than posturing and distraction posited by a moot American political regime. Putin, knowing this, chose the high road by refusing to volley aggressive diplomatic actions with the outgoing Obama administration — possibly halting the initiation of war in the process. 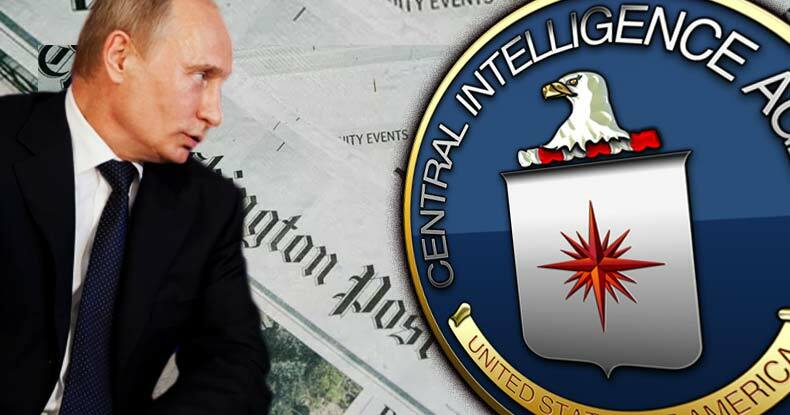 Accusing Russia of hacking the election, the electrical grid of Vermont, or installing propagandists inside the United States in order to elect Trump and destroy the nation constitute the Washington Post’s futile attempt to shirk blame for its own failed reporting — whether or not the irresponsible attacks are stained with fingerprints of the CIA. That Russia is responsible for anything other than bemused observation of the U.S.’ current chaos is blatant propaganda — the one thing at which the Washington Post manages to excel.